Picking peas and picking beans requires an eagle eye. 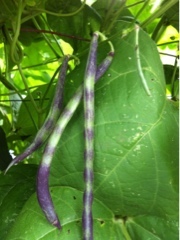 When the leaves and the beans are the same color it is easy to miss them, and then they are too stringy and tough to eat. 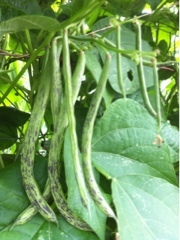 The first beans this year have a funny name: rattlesnake bean. Selected because they are two toned and easier to locate on the plant, our initial taste tests are tender, sweet and delicious. We did not cook them, just ate them with a bit of hummus and loved the taste! On Sunday there were 3 beans per share Today a handful per share. 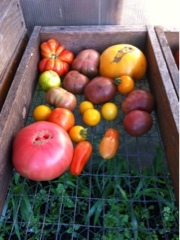 Last week there were 5-6 tomatoes per share. This week at least twice that.